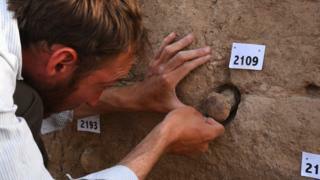 Eight 5,000-year-old artefacts looted from Iraq following the fall of Saddam Hussein will be returned after being identified by the British Museum. The objects were seized by police from a now-defunct London dealer in 2003. The collection has spent 15 years in the hands of the state but has now been established as being from a site in Tello in southern Iraq. The items, which include a marble bull pendant, will be presented to the Iraqi embassy in London on Friday. The British Museum’s director Hartwig Fischer said the organisation was “absolutely committed to the fight against illicit trade and damage to cultural heritage”. In addition to the bull pendant, the collection – which dates back to 3000BC – includes a gypsum mace head, two stamp seals, an inscribed pebble and three clay cones bearing Sumerian cuneiform script. None of the items were accompanied by documentation when first discovered in England by the Metropolitan Police – and the dealer they were taken from made no attempt to reclaim them. After years in police storage, the collection was taken to the British Museum in 2018. By reading the inscriptions on the items, museum experts were able to determine not just which site they belonged to, but also which parts of specific building remains they came from. The cone inscriptions bore the name of the Sumerian king who commissioned them, the temple they came from and the god the temple was dedicated to. Following a presentation ceremony involving the British Museum and Iraqi ambassador to the UK, the antiquities will be returned to Baghdad next week. Iraq’s ambassador to the UK, Dr Salih Husain Ali, said he wanted to express his “thanks and appreciation” to the museum, adding that cooperation between the two countries was “vital for the preservation and the protection of the Iraqi heritage”.